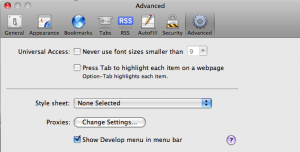 Activate the Developer menu in Safari 4's preferences. Apple’s Safari web browser was upgraded to version 4 yesterday and with it came an update to the developers tools first introduced in Safari 3.1. The new version is set to give Firefox’s FireBug plugin some very serious competition. Not only does the Development environment look and perform very well, it’s also very full featured. When designing a new web page frequently plenty of time is spent making minor changes, updating the server and then checking the results in the web browser. This three stage process slows down the design process and hampers the creative flow. Page inspection tools allow you to review and edit your page live in the browser, allowing you to easily try out different CSS rules or HTML edits until you know what you want. And what you see is literally what you get – your preview is the actual web browser. A line of HTML highlighted in the rendering. 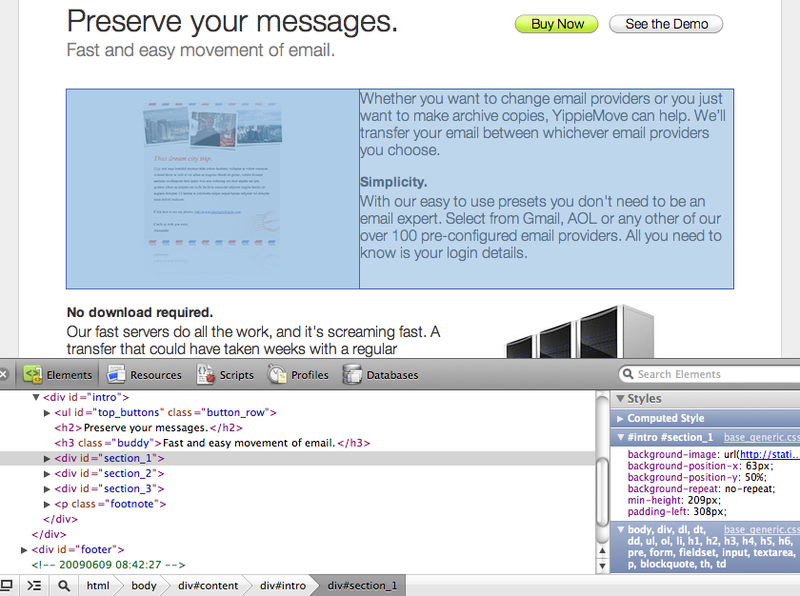 Safari 4’s “Web Inspector”, shown with Develop / Show Web Inspector, is Apple’s take on page inspection. 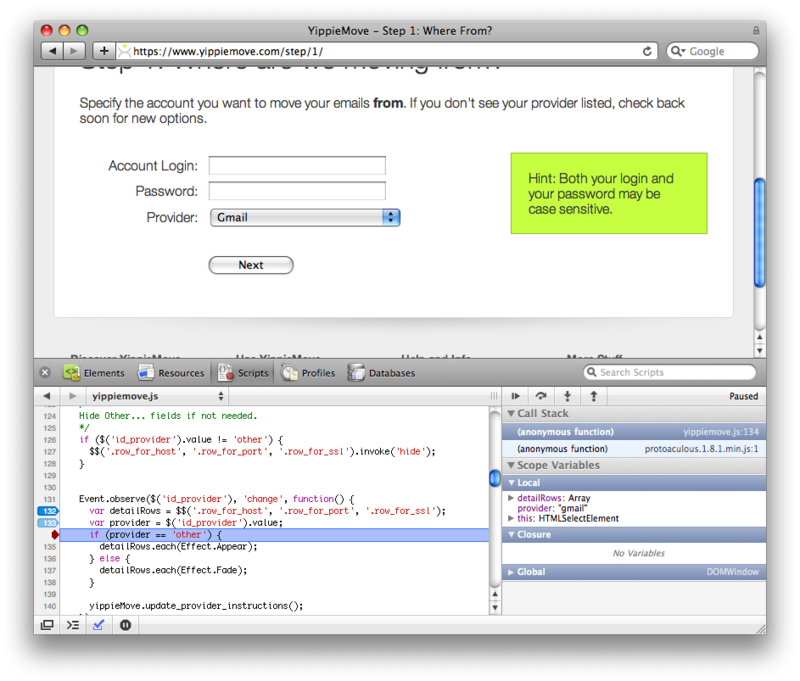 Reminiscent of Firebug’s equivalent, the inspector area attaches to the bottom of the Safari window. On the left hand you get the HTML for the page and on the right hand you get the full hierarchy of CSS affecting the currently selected element. By choosing the magnifier icon you can click on any element in the page – a headline, an image, a paragraph – and bring it into focus in the HTML view. The same can be done by selecting tags in the HTML source code directly. When an element is selected it is outlined in blue in the page. A light blue box shows the dimensions of the element itself and a darker blue box behind it outlines the element with margins included. This is helpful when an element is not positioned where you want it or it’s the wrong size. The blue boxes will let you know if the problem is with the margins or if there is something else going on. Once you have a theory of what you’d like to change you can go in and edit the effective CSS directly using the Styles panel on the right hand side. 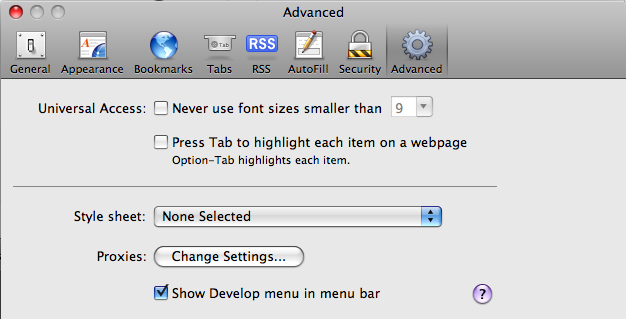 For instance you could tweak the font-size by double clicking the font-size value and typing in a new number. A set of checkboxes also allow you to toggle individual CSS rules on or off to see how that affects the page as a whole. A great tool for hunting down what CSS rule is doing what. For each section in the Styles panel you also get the responsible selector and the CSS file it comes from, making it easy to copy your changes back to the original style sheet when you are done with your edits. The CSS editor is well designed but it does not seem to allow adding new CSS rules live, a feature available in FireBug. Timing the bits and pieces of a web page. By laying the load time out in a timeline various sources of delay can be tracked. For example in the screenshot above the main document takes just short of half a second to load. We can also see that the CSS file request goes out even before the main HTML is finished loading, as Safari finds the CSS link in the header almost immediately. For each bar the semitransparent section is the latency – the time until the first byte of the response. So in the above case we can see that the latency makes up the majority of the load time. We can also see that the two images used on the page are loaded concurrently and that they start loading immediately when the CSS has been retrieved. Finally the colorful bar on top breaks the total load time down by type and lets us know the whole page finished loading in 1.2 seconds. Individual resources can be inspected, allowing the developer to review the size and contents of each resource. In the same section the request and response headers can be reviewed. This is useful for the web server administrator in order to determine compression status and cache expiration headers. Strangely enough POST parameters don’t seem to show up which could be a serious problem for debugging. This CSS file was gzipped and comes with a far future expires header. Great! There are some flaws. Two were mentioned above: there does not seem to be a way to inspect POST data, important especially when debugging AJAX, and it does not seem possible to add new CSS rules dynamically as you could in FireBug. A more minor flaw is a missing feature. There is no page optimization analysis tool such as Yahoo’s YSlow or Google’s Page Speed. These tools help analyze pages for performance problems. For example they check for additional compressibility in images and for correct headers. 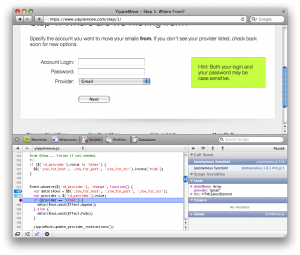 These flaws aside the Development tools found in Safari leave little to be desired. All the features you expect are there and the package is polished far beyond what’s ordinary for web development. 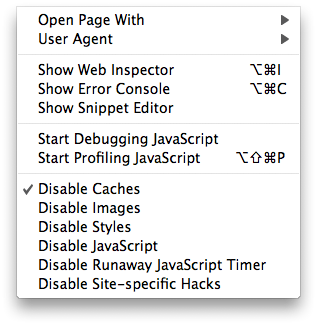 Apple has clearly been looking to FireBug when picking their features and that’s a good thing. FireBug has for a long time been setting the standard for these kinds of tools, but has been suffering from engineers’ syndrome: heaps of features but with little mind to UI design and detail polish. Safari 4’s development environment meets nearly all the same requirements and does it in style, bringing an excellent choice to the web developer’s toolbox. Read more about the new developer tools at Apple’s What’s New page.